Built-up roof (BUR) systems made with asphalt have been a mainstay of the low slope roofing industry for over a century but keep evolving with the times. Constructed in place, with multiple layers of protection using hot asphalt as a binder, they provide a very high quality roof that has a long history of performance and durability. While their share of the market has decreased with the introduction of other asphaltic and non-asphaltic low slope roofing systems, BUR remains an important sector of the industry. Specifically, a BUR system is made by building up multiple layers of waterproofing ply sheets that are adhered using hot asphalt and finished with a variety of top surfaces. The ply sheets are most commonly made by coating a fiberglass mat with oxidized asphalt (ASTM D2178-13), but they can also be made using organic felts (ASTM D226-09) or synthetic fibers (ASTM D5726-13). The asphalt used to adhere the ply sheets on the roof is predominantly oxidized asphalt specified using ASTM D312-15, but an alternate specification for oxidized asphalt (ASTM D7654-10), SEBS modified asphalts (ASTM D6152-12), or wax modified asphalt products not covered by a current ASTM specification (e.g. Permamop®) can all be used. A BUR system will have up to 4 layers of adhered ply sheets finished by several possible surface layers; including a flood coat with gravel surfacing, a granulated cap sheet made with oxidized or polymer modified bitumen, or a cold applied solvent-or water-borne coating. The most common asphalt binders used to make the BUR system are Types I to IV as specified by ASTM D312-15. The progression from Type I to IV creates materials that have a higher softening point that can therefore be used on progressively steeper sloped roofs. For example, a Type I BURA has a softening point range of 135-151°F and is limited to slopes less than 2 percent (1/4 inch/foot) while a Type IV BURA (built-up roofing asphalt) has a softening point range of 210-225°F and can be used on inclines from 2 percent to 50 percent (6 inch/foot) and with vertical flashings. Type III and IV BURA are by far the most frequently used binders for BUR systems. In addition to its use in BUR systems, BURA is also used in other applications, e.g. to adhere insulation or cover boards and various cap sheet products including fleece-backed single ply membranes. The asphalt binder is taken to the job site either in bulk trucks for large jobs or solidified into 50 to 100 lbs meltable containers or kegs. The kegs must be melted and heated in roofing kettles at the job site. Bulk trucks can heat the material to the necessary temperature, or the material can be transferred to a kettle for additional heating. Asphalt is transferred or pumped up to the rooftop and applied using either mechanical applicators or mops. It was recognized back in the 1970s that the proper asphalt temperature at the time of application was the key to getting the proper amount of asphalt applied. Too little asphalt, resulting from too low a viscosity, could give poor adhesion; while too much asphalt, resulting from a high viscosity, could result in slippage. Because viscosity and thickness of the asphalt would be difficult to measure on the roof, manufacturers were asked to provide the temperature at which the specific BURA is at the target viscosities for mopping and mechanical application viscosities. This parameter is called the Equiviscous Temperature or EVT. As outlined in ASTM D1079, EVT is defined as being measured in the mop cart or mechanical spreader just prior to application to the roof. Ambient conditions in addition to jobsite conditions that may include different deck types and materials may require a modification to the application temperature above or below the EVT, but the application temperature should always remain within 25°F of the EVT. The redundancy of a BUR system and asphalt’s inherent resistance to moisture can be directly attributed to the superior performance of BUR systems. During this hot construction process workers applying the asphalt are exposed to fumes. Both NIOSH (National Institute for Occupational Safety and Health) and IARC (International Agency for Research on Cancer) have identified a potential cancer hazard associated with exposures during these roofing applications. In their 2000 Health Hazard Review NIOSH judged exposure to roofing asphalt fumes to be a potential occupational carcinogen,2 while in 2011 IARC found that occupational exposure to oxidized bitumen (asphalt) and its emissions during roofing to be a probable carcinogen.3 NIOSH and IARC only evaluate hazards as opposed to the actual risk at specific exposure conditions. Temperature is a key factor in controlling emissions from asphalt, and thus worker exposure to fumes. Laboratory investigations have shown that emissions and asphalt fume or its constituents increases exponentially with temperature.5,6,7 This has been seen to translate into worker exposure in field studies of BURA8,9 and asphalt paving workers10,11 that have shown that worker exposure to asphalt fumes can be cut at least in half by reducing temperatures by 50°F. Because of the importance of temperature, many efforts to reduce exposure have been focused on controlling that parameter. Many of the recommended practices in the document developed by NIOSH in conjunction with industry address ways to reduce the drop in temperature between kettle and roof and therefore reduce the kettle temperatures needed to maintain a specific EVT.5 In addition, ASTM recently approved changes to the specification for standard BURA (D312) designed to better control temperatures used in the field in order to lower exposures. The new specification puts a cap on the kettle temperature used with this product in order to eliminate overheating high flash point asphalts; and maximum EVTs were incorporated into the new ASTM specification in order to reduce temperatures used on the roof. These new EVT levels were taken from data on typical EVTs in 19901 and, since it is widely accepted that EVTs have risen since that time, this should result in products that can be applied at lower temperatures. Lower temperature application means lower temperatures needed for kettles and both changes would help reduce fume exposure. New products have also been developed that reduce fume exposure during BUR construction. 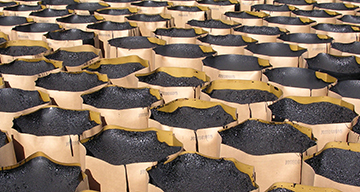 In the mid- 1980s a proprietary wax-modified BURA material was developed by Owens Corning using similar technology to what would later be used in warm-mix paving.12 The resulting material had softening points similar to Type IV BURA but application temperatures in the range of Type II BURA, resulting in EVTs 80 to 100°F lower than standard Type IV. This lower EVT allowed it to be applied at much lower temperatures, and hence with much lower fume exposure. The patent for this product has expired and an effort is currently underway at ASTM to write a specification to cover this and similar wax-modified BURA products. In addition to fume control, odor mitigation is an important improvement in current BURA products. As with all asphalt products, sulfur-containing molecules emitted by BURA can be detected by humans at extremely low concentrations in the air. Various suppliers have developed methods that include an odor suppressant chemical to reduce these odors in order to reduce complaints from hot jobs. The advancements in BURA technology targeting fume and odor control are a good start and the industry will continue to work toward reducing temperatures, incorporating new products, and improving work practices so that this valuable form of low slope roofing can continue to be used in the future. Cullen W.C. EVT: A concept that warrants standard status, Professional Roofing, pp. 36-38, 1990. National Institute for Occupational Safety and Health (NIOSH): NIOSH Hazard review: health effects of occupational exposure to asphalt. DHHS (NIOSH) Publication No. 2001-110, Cincinnati, OH. 2001. IARC Monograph, Volume 103, Bitumen and Bitumen Emissions, and some N-and S-Heterocyclic Polycyclic Aromatic Hydrocarbons, available free online. NIOSH 2003]: Asphalt fume exposures during the application of hot asphalt to roofs. DHHS (NIOSH) Publication No. 2003-112 (June 2003).]. Brandt, HCA and PC de Groot, A Laboratory Rig for Studying Aspects of Worker Exposure to Bitumen Fumes, American Industrial Hygiene Association Journal, 60: 182-190, 1999. Cavallari, JM et al., Temperature-Dependent Emission Concentrations of Polycyclic Aromatic Hydrocarbons in Paving and Built-Up Roofing Asphalts, Ann. Occup. Hyg. 56(2), 148-160, 2012. Gasthauer, E et al., Characterization of Asphalt Fume Composition by GC/MS and Effect of Temperature, Fuel, 87: 1428-1434, 2008. Kriech, A. et al., Evaluation of worker exposure to asphalt roofing fumes: Influence of work practices and materials, J Occup Environ Hyg, 1: 88-98, 2004. Franzen MR, Trumbore DC, “Reduction of Asphalt Fumes in Roofing Kettles.” Environ Sci Technol 2000; 34(12):2582-2586. Cavallari, JM, et al., Predictors of airborne exposures to polycyclic aromatic compounds and total organic matter among hot-mix asphalt paving workers and influence of work conditions and practice, Ann Occup Hyg, 56(2), 138-147, 2012. Deygout, F and G Auburtin, Impact of Some Field Factors on Inhalation Exposure Levels to Bitumen Emissions During Road Paving Operations, Ann.Occup. Hyg. 59(2) 158-172, 2015. US Patent 4,554,023 Janicki, R.T., Modified Asphalt. US Patent 6,069,194 Franzen, M.R. et al., Packaged asphalt containing fume-reducing additives and method of producing same. US Patent 6,107,373 Janicki, R.T., et al., Consumable asphalt containers and method of reducing fumes from a kettle of molten asphalt. US Patent 6,130,276 Vermilion, D.R., et al., Method of reducing fumes from a vessel of molten asphalt. US Patent 6,488,988 Trumbore, D.C., et al., Method of reducing fumes from a vessel of molten asphalt. NIOSH 2007: Reducing worker exposure to asphalt fumes from roofing kettles. DHHS (NIOSH) Publication No. 2007-115, February 2007.